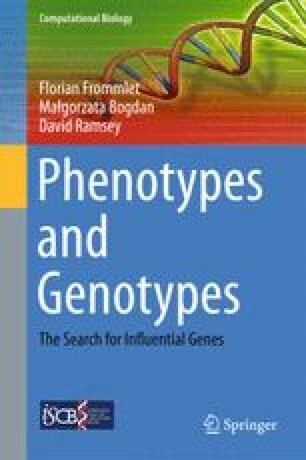 This chapter mainly serves to introduce the terminology used in genetics and explain the biological context in which the statistical problems discussed in later chapters arise. Section 2.1 starts with a review on the fundamentals of genetics, including the process of cell division. These molecular mechanisms lead directly to the crucial concept of genetic distance. We will discuss a number of genetic maps, which are mathematical models that describe the relationship between genetic distance and physical distance on a chromosome. Section 2.2 is concerned with different types of genetic association studies. Several different experimental populations are introduced, and the basic principles of QTL mapping are explained. QTL mapping generally refers to performing genetic association studies with experimental populations. However, the term association study tends to be used in the context of outbred populations, as discussed in detail in Sect. 2.2.3. The chapter finishes with some other important types of study like admixture mapping and family-based studies.